You are here: Home / Natural Solutions / Is Colloidal Silver an Effective Natural Antibiotic? I’ve been using colloidal silver in place of antibiotics for almost 3 years now. 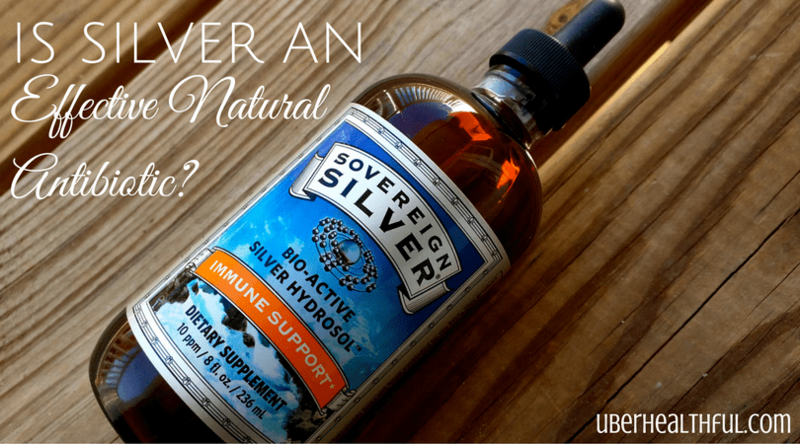 In this review, I share my own experience with silver in treating a variety of infections. As you read this, keep in mind I am not a medical doctor or anything close to that. I am a person who seeks out natural ways to heal my body after suffering negative effects of prescription drugs. Before I get into my own story, I want to point out some important things about colloidal silver that may be of interest to you if you are researching its effectiveness. “What we have actually done was rediscover the fact that silver killed bacteria, which had been known for centuries… when antibiotics were discovered, clinical uses for silver as an antibiotic were discarded.” – Dr. Robert O. Becker, M.D. Why Use a Natural Antibiotic Instead of Prescription? A few years ago, I had a urinary tract infection in my body. I went to the doctor and was prescribed antibiotics. The first round did not knock out the infection and the doctor gave me another round. All in all, I was put on antibiotics for about 6 weeks. At the time, I didn’t know that antibiotics could harm my body. As a result, I ended up with an serious imbalance of friendly gut flora which caused “leaky gut.” That led to many problems such as my seborrheic dermatitis and flare-ups of cystitis, which is an inflammation of the bladder. I didn’t know that the antibiotics caused these problems. After lots of research, I zeroed in on the cause and vowed never to take them again. I am still dealing with the permanent damage and effect of prescription antibiotics and have learned to manage the flare-ups though proper eating and natural solutions. What I find even more interesting is that people will ingest harmful drugs prescribed by a doctor without thinking twice but hesitate to use natural solutions that won’t harm them. If only I knew then, what I know now. I rarely get sick these days, maybe once a year. I take extremely good care of myself and am hypervigilant about doing so. About two years ago, I caught a very bad upper respiratory infection. My throat was so sore I could not swallow and lost my voice. My eyes became infected as well. I was a mess. I immediately started taking colloidal silver. I went into emergency mode and put myself on 7 teaspoons a day. As a result, the upper respiratory infection went away and my eye infections cleared up in record time. I had some serious dental work done and about one year later, got a very painful infection in that area. It was awful, swollen, and made the left side of my face and head hurt terribly. I immediate got some silver and gauze. I ingested 7 teaspoons a day. I also wet a gauze with the silver and held it on the infected area for about 10 minutes 3 times a day. I also swooshed colloidal silver around in my mouth on the infected tooth for 2 minutes twice a day. That infection was gone in about 2 days. My sweet cat has nails as sharp as razor blades. She has to get them trimmed at the vet and inbetween trims, they can do some damage! One day I was playing with her and she swiped me good on my finger. I did all the right things. Cleaned the cut right away and applied some antiseptics to it. Within a day, it was infected. Swollen, red and hurt like nobody’s business. I decided to try the silver gel. I used it 3 times a day on the cut and the infection was gone within 1.5 days. I still had the cut but it was healing normally without the painful infection. Years ago when my son was a toddler, he had an unfortunate mishap and got a serious burn on his foot. I rushed him to the hospital and they immediately cleaned it and put Silvadene cream on it. I had to change the dressing three times a day and apply the Silvadene. Guess what the main ingredient is in the cream? 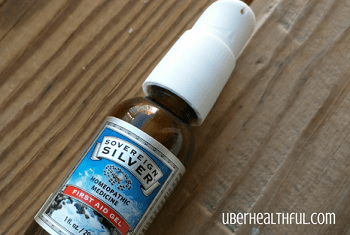 After using colloidal silver for nearly three years, I personally have experienced it’s natural antibiotic benefits. I have no strange side effects from using silver in either the liquid or gel form. Silver has been my saving grace for the times when I need an antibiotic that works. I hope you got some value from reading about my experiences with silver. As a reminder, I am not a medical professional, just sharing how I’ve used silver and its effects. I’ve tried a few different brand of silver and the I like best is Sovereign Silver. You can find it at many health food stores, Whole Foods Market, or get it here on Amazon for best pricing. Have you used silver? What are your thoughts about it?